ST. GEORGE – A Hurricane teen accused of attempting to detonate a homemade bomb at one high school and vandalizing another with an ISIS-related flag and graffiti appeared in juvenile court Monday for a preliminary hearing. Prosecutors called nine witnesses throughout the day who testified to the events of March 5, the day the bomb scare at Pine View High School occurred, as well as an incident involving the planting of a fake ISIS flag at Hurricane High School Feb. 15. 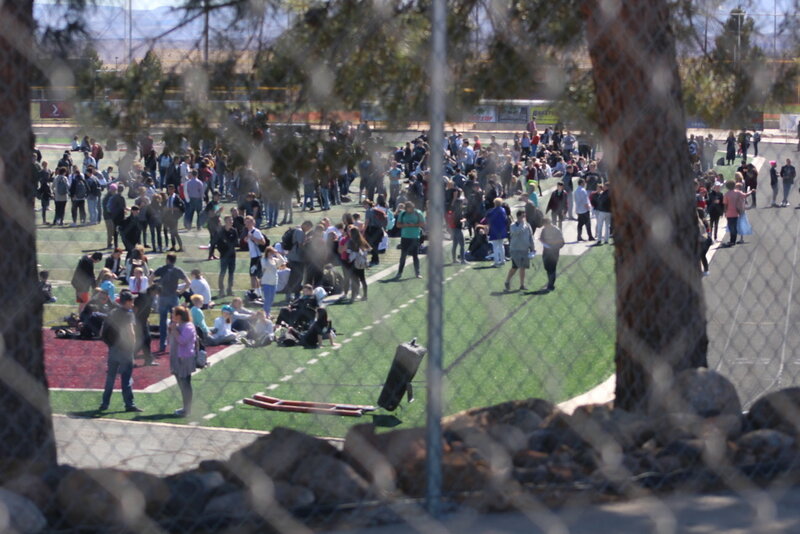 The suspect, who is not being named by St. George News because he is a minor, faces first-degree felony charges for attempted murder and possession of a weapon of mass destruction in connection with the March 5 bomb scare that prompted the evacuation of 1,100 students. The alleged bomb was kept in a backpack the accused left in the school’s cafeteria on the day it was later discovered. The teen also faces misdemeanor charges stemming from a February incident in which he allegedly replaced the American flag at Hurricane High School with an ISIS flag and spray-painted an ISIS-related message on school property. 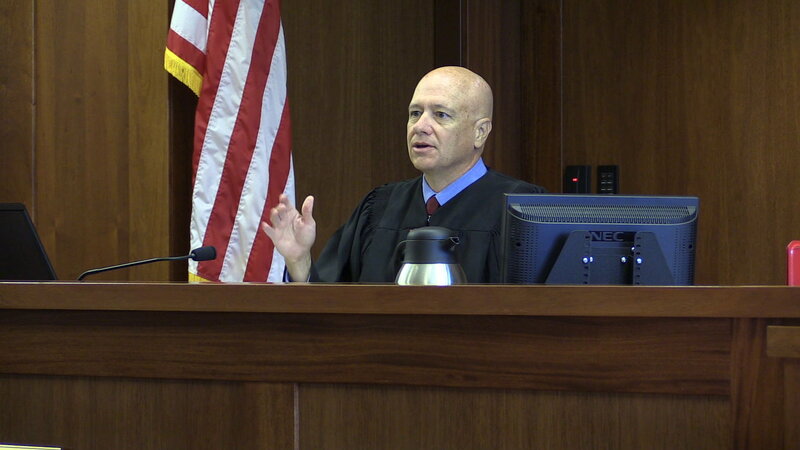 The teen faces the possibility of being tried as an adult should juvenile court Judge Paul E. Dame find there is enough probable cause to move the case forward to trial. The majority of those who testified Monday were law enforcement officials who were involved in the response and investigation into the Pine View bomb scare. They recounted how a backpack had been left in the school’s cafeteria by the vending machines during the school’s lunch period that, at one point, was reported to have smoke coming out of it. Students alerted faculty members as well as St. George Police officer Michael Koester, the school resource officer. Though the backpack wasn’t smoking at the time, items within the backpack were considered suspicious and it was “quietly removed” from the cafeteria so as to not cause a stir among the students, Koester said. “It was suspicious and couldn’t be left in the cafeteria,” Koester said. Koester then contacted fellow officer Gage Schimbeck, Pine View Middle School’s resource officer, and a member of the Washington County Bomb Squad at the time. Schimbeck inspected the contents of the backpack. In it was a metal soup can filled with what appeared to be a “significant amount” of gunpowder and BBs that were later identified to be shotgun pellets. Attached to the can was a fuse made of masking tape, a matchbox, three water bottles filled with an amber-colored liquid he believed to be gasoline and clothing that matched a junior ROTC uniform. 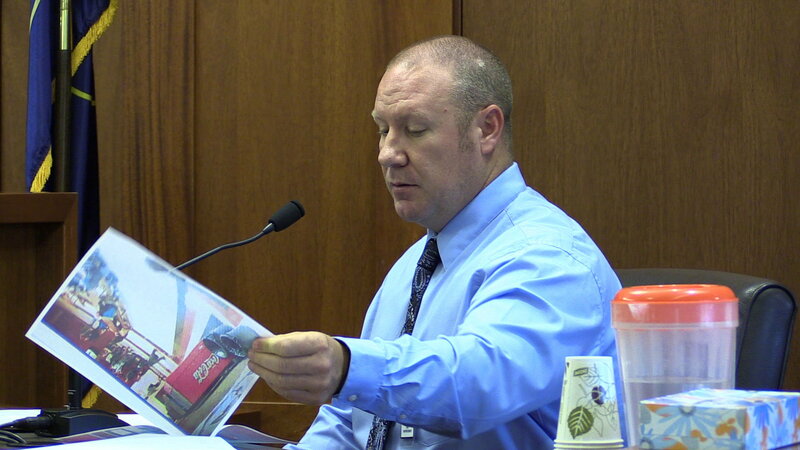 “Once I realized what I had, I informed officer Koester we had a suspected (improvised explosive device),” Schimbeck said during his testimony. The school was evacuated at that point and additional police officers and the Washington County Bomb Squad were called in to properly examine and dispose of the possible bomb. Koester said he reviewed the school’s surveillance system to see if it had caught the individual who dropped the backpack, and it had. In his review of the surveillance footage, Koester said he followed the footage from the time the suspect was dropped off at the school carrying two backpacks to when he dropped the one backpack by the vending machines and walked away. Koester then made copies of the suspect toting around the two backpacks and sent them to officers and faculty. One of those photos was given to St. George Police Detective Brandon Dunbar and a fellow officer who used it to identify the suspect teen among his fellow students who had been evacuated to the school’s football field. The boy was taken into custody and then taken to the Police Department where he was interviewed by Dunbar and the other officer. During the hearing Monday, prosecutors played video of the interview – an hour-long exchange that was a part of a four-hour recording. The boy was placed in one of the Police Department’s interview rooms and told his Miranda rights prior to speaking with the officers who asked him to walk them through his day. The boy said he went to classes at Success Academy that morning and later went to Pine View High School for a seminary class (time students are released from school for seminary instruction associated with The Church of Jesus Christ of Latter-day Saints) and the Air Force junior ROTC program there. He initially told the officers that he had one backpack, yet changed his story after being shown the surveillance image of him with two backpacks. The teen suspect then said he found the backpack in the laundry room of his grandparents’ home where he lived and used it for his junior ROTC clothes. While at school, he said, he put the backpack on the cafeteria floor while talking to a friend who, a moment later, told him the backpack was smoking. He panicked, the suspect told police, because he didn’t know what was happening. That story changed once officers told the teen about the items they found in the backpack. “You lit the fuse, didn’t you?” Dunbar said during the interview. However, the attempt to ignite and detonate the bomb failed. “If it blew up, great. If it didn’t, oh well,” the teen said in the interview. It had been something he had been planning for weeks, the teen suspect told police, and said it is was “pretty cool” to see police descend on the school once the bomb scare was underway. The teen also told police he had been looking up items related to the Islamic State terrorist group over the internet. The other officer interviewing the boy said he had been a member of the junior ROTC once, observing it a contradiction to be part of a group that wants to defend the nation while also admiring a group like ISIS that wants to destroy it. “Oh yeah, that was me,” the teen suspect said when the officers asked about the incident involving the American Flag at Hurricane High School being replaced with a black, homemade ISIS flag. During the same incident, the phrase “ISIS is comi” was spray-painted on one of the school’s eastern walls. Leon Gubler, a custodian at Hurricane High, noticed the American flag had been removed and damaged. Gubler took down the homemade ISIS flag before school started so it wouldn’t alarm students or the parents dropping them off. As for the graffiti, he estimated it cost the school over $1,400 to remove. Hurricane Police officer Craig Stowe, Hurricane High’s school resource officer, said he checked the school’s surveillance system and saw someone – presumably a male – approach the flagpole at around 3:30 a.m. and take the flag down. Unfortunately the camera was unable to get a good shot of the vandal’s face. The teen suspect told Dunbar he had made the flag at home and used paint he found in his grandfather’s shed for the graffiti. He wanted to scare the students at Hurricane High because he felt they hadn’t treated him well while he was attending classes earlier that school year before he subsequently dropped out. He felt shunned by the kids in one of his classes, the teen suspect said, while a particular student in another class made him feel stupid and unwanted. He used his laptop computer to learn how to make the flag and to research ISIS in general and possibly find a way to contact the group in the future, the teen suspect said. The internet searches the boy conducted prior to his arrest would become part of state evidence found by the FBI. The second backpack the teen had on him at Pine View High School March 5 contained his laptop and a notebook, all of which were taken into evidence by police. 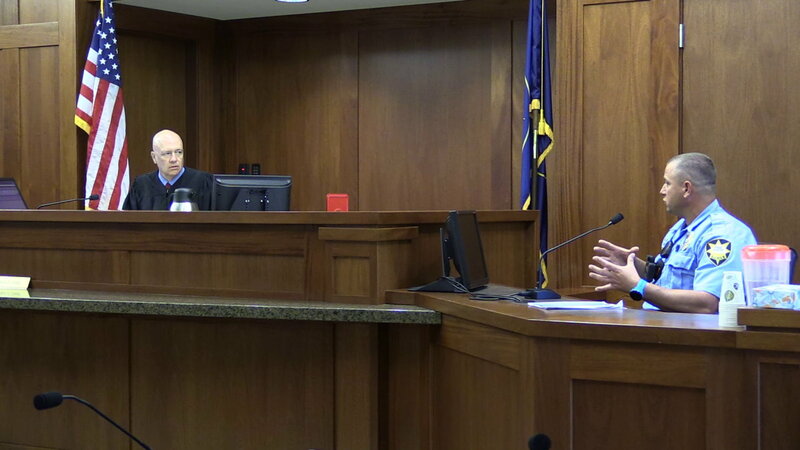 Investigators found drawings in the notebook of interest due to what Deputy Washington County Attorney Angela Adams, in her court testimony Monday, called “crude” drawings of a possible explosive device with the term “Tannerite” written by it. Tannerite is a brand of commercially available explosive powder that can typically only be ignited by a round from a firearm, FBI Special Agent Chris Andersen said during his testimony Monday. 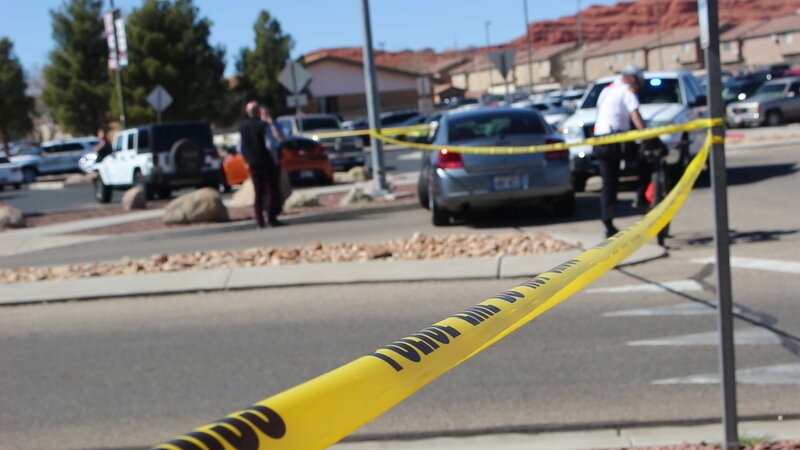 As for the laptop, St. George Police accepted an offer by the FBI to analyze evidence related to the bomb scare case and so it was among the evidence sent to the federal agency. The FBI did a keyword search of the internet search history on the teen’s laptop, Andersen said, and found “multiple” searches conducted from Feb. 7 to the time of the teen’s arrest that related to ISIS or how to make a potential explosive. The keywords the FBI looked for included, among others, ISIS, bomb, GITMO, fuse and Hurricane. A search result for “fuse” yielded a connection to a website that showed viewers how to make a fuse with masking tape – a type similar to the one used on the failed Pine View device, Andersen said during court testimony. The “Hurricane” search results mainly related to the high school and searches for blueprints, floor plans and similar documents. This type of search wasn’t limited to Hurricane High School, Andersen said. The teen had searched for plans for at least 20 schools across Utah, including Utah Valley University in Orem and Lone Peak in Highland. Other searches included items connected to ISIS recruiting Westerners, propaganda and possibly how to contact ISIS, Andersen said during testimony, though no evidence was found indicating the boy ever communicated with the terrorist group. A “shocking” search history from March 3, two days before the bomb scare, included a search for tackle knuckle gloves and ISIS uniforms, the FBI agent testified. Prosecutors will rest their case when the preliminary hearing resumes Wednesday, Adams said, adding the state “feels confident in its case” against the teen suspect. Afterward, the teen’s attorneys, Matthew and Stephen Harris, will begin to present their defense and begin to roll out their witnesses. Ok parents, I’m thinking you should have caught this before it had to go this far. Communication with your child is key, along with showing your child they are loved unconditionally. Teenagers are learning who they are and will seek out answers on the Internet if they aren’t being in a healthy relationship with their parents. Schools can’t be expected to raise a child. It would be nice if we could teach the kids not to put other kids down as well, but its always been this way, it’s human nature I guess, to step on others to feel better about ones self. I feel sorry for this person and for any other person seeking revenge, it should have never got out of hand this way. I hope his next search on the Internet is about peace and good vibrations/ higher frequences so he can come out of this victorious and find the positive aspects this world has to offer. learn that his negative behavior, thoughts and actions are not going to benefit him in any way. That his desire will to NOT repeat this or go down a lonely short road.